This morning Mr. 761 and I were discussing tonight’s dinner. We do this sometimes — food is a big part of planning our days…. We settled on Dancing Chicken (stuffed with limes, cooked on the barbecue, standing up/impaled on a clever contraption that makes it look like it’s, well, dancing). With this, Mr. 761 requested cranberry sauce. You may recall that recently I cleaned out my pantry of things with glucose/fructose/corn syrup etc. His fave cranberry sauce was one of those things that got the boot. I suggested that I make cranberry sauce for him – much healthier and tastier. I had some frozen cranberries but went to the store looking for fresh ones (do they have a season? I’m sure they do. I don’t know what it is, obviously, because there were none in the store). I gave in and bought canned stuff, but the search for cranberries made me think about dessert….. 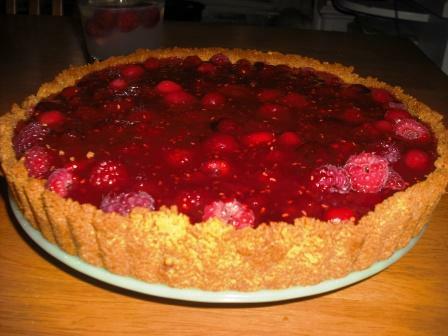 I made Raspberry/Cranberry Tart for dessert tonight, and it was much oohed and ahhed over, I have to admit. 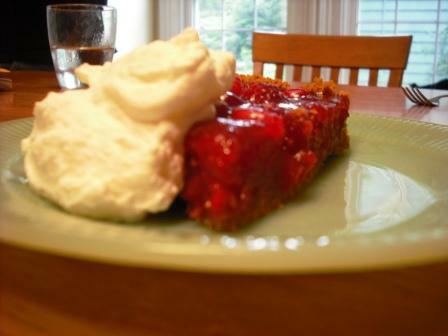 It was delicious – tart and sweet and just the right thing after our delicious dinner. Food photography is harder than it looks, so I hope that you can see just how luscious this tart was… shiny and studded with berries; glistening with different red and pinks… oh, it was pretty! Take about 9 or 10 graham crackers and crush into crumbs (I used a food processor but a rolling pin works too). You’ll want about 1 and 1/4 cups of crumbs. Add 3 tablespoons of maple syrup, and 3 tablespoons of canola oil or melted butter. Tamp this down into your tart pan and bake at 350°F for about 8 minutes. Take about a cup of raspberries and a 1/2 cup of cranberries, mash with a fork or an immersion blender. Once pureed, add enough water to make two cups of liquid. Put 1 cup of sugar into a pan with 2 tbsp of corn starch, add the pureed mixture to it. Bring to a boil, stirring occasionally. Let boil for 2 minutes, and remove from heat. Add 1 pkg gelatin, 1 tablespoon of butter, juice of half a lemon and some lemon zest. Stir until the gelatin dissolves completely. Let fruit mixture cool somewhat — until it’s sort of spoonable. Just try not having seconds of this! Take about a third of the mixture and spoon onto graham cracker crust. Add another cup and a half or so of fruit, then cover with the remainder of the gelatin mixture. Cool. Serve with sweet whipped cream (a bit of vanilla, some sugar, and some lemon zest). Lots has been happening at Box 761, and I’ll write more another day. Tonight it’s a bit cool and rainy, and I have a strong urge to grab a good book and cuddle with my dogs. Next blog will discuss my love affair with my new built-in bookshelves (thanks for the tools, Dennis! ), the stinky dog who came to call at 4 a.m. the other day, the oppressively lingering odor of skunk and how to remove it…. We may even discuss the continuing next-to-nakedness of next-door neighbor, the speaker phone function on his blasted cordless phone, and some more places that My Husband Hates. Mrs 761: I can hardly wait for your next blog! Stinky dog & skunk odor…..AND the next-to-naked, next-door-neighbours. There’s always something worthy of note going on at Box 761, Lynn. Harder to find the time to write now that Mr. 761 is here, but it’s a rainy day, so I may find the time…. I love your comments, thanks so much for the feedback! I will, Erica! It’s been kind of busy here, but I will write more.